Prepare these impressively simple cheese recipes in no time. During the holidays we’re all looking for fresh, new takes on classic party food that will make our guests feel at home. These three easy holiday recipes celebrate the diverse flavors and textures of La Bottega di BelGioioso cheeses. Best of all, they won’t bust your holiday party budget. By stocking our handcrafted artisanal cheeses in your fridge this holiday season, you’ll have all the essentials to create magic for an intimate soiree or a grand gala. This recipe is so quick and easy to put together, yet so packed with complex flavors that you’ll want to make it whenever you entertain! The creamy texture and mild tang of the Crescenza-Stracchino pairs perfectly with sweet, crunchy apple slices and smoky bacon. Fresh, peppery arugula rounds out these incredible bite-sized hors d’oeuvres. In a large bowl, toss apple slices with lemon juice; pat dry. Spread each slice with about 2 teaspoons of Crescenza-Stracchino cheese. Top with bacon and arugula. Sprinkle with cracked black pepper to taste. Puff pastry is a classic holiday favorite. It makes any occasion even more festive when you pair it with handcrafted La Bottega di BelGioioso cheeses made from locally sourced Wisconsin milk. A marriage of golden brown pastry pockets with nutty, yet slightly sweet Artigiano™ Classico and extra aged American Grana® Parmesan cheese creates a holiday treat worthy of any celebration. These pockets are so beautiful your guests will swear they came from a fancy catering company, but your secret is that you prepared them all in under an hour. Line a large baking sheet with parchment paper. Arrange the frozen pastry shells on the baking sheet and bake until they puff and become lightly brown (about 20 min). Using a small knife, cut out the center of the pastry shells. Meanwhile, stir the cream, milk, salt and pepper in a medium bowl. Stir in the spinach, Artigiano Classico, American Grana and green onions. Spoon the mixture into the baked pastry shells. Bake until they are golden brown and the filling is hot, (about 25 – 30 min). Serve while hot. 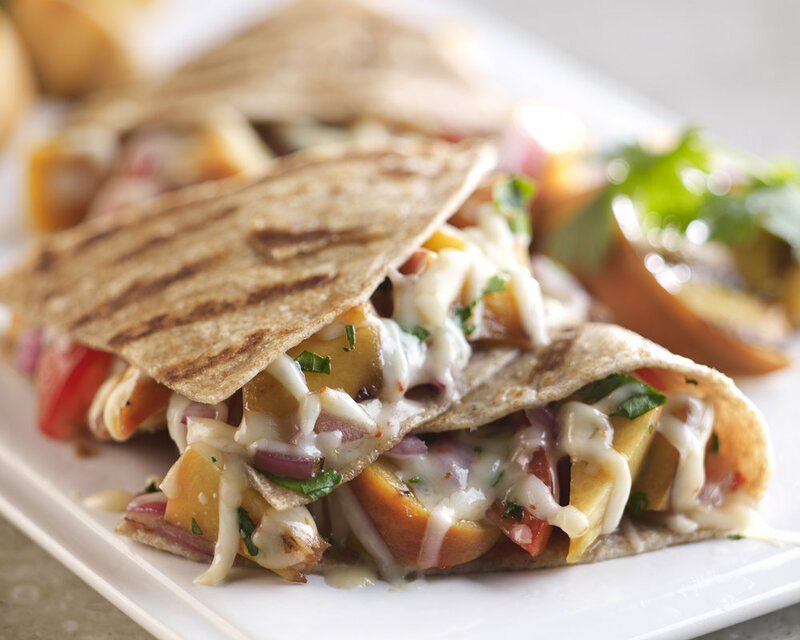 Everyone knows that cheese and tortillas are a match made in heaven, but adding sweet and smoky grilled peaches, juicy cherry tomatoes, and fresh cilantro makes this a quesadilla that everyone at your holiday gathering will be craving long after they depart. The melted zesty Peperoncino® cheese with chili peppers holds this delicious treat together, and it takes only minutes to make. Slice the peach in half from pole to pole and remove the pit. Slice each half lengthwise into ½ inch pieces. Thread the peach slices onto metal or bamboo skewers. Brush the peach skewers and onion rounds lightly with olive oil and place them on the hot grill. Cook the peaches for about 2 minutes per side until grill marks appear and the fruit has softened slightly. Cook the onion for 3 minutes per side until slightly charred and softened. Roughly chop the peaches and onions. To assemble, sprinkle ¼ cup cheese on half of one tortilla. Top with a quarter of the peaches, onion, tomatoes and cilantro. Sprinkle with another ¼ cup of cheese and fold the tortilla over to close. Grill the quesadillas for 3 minutes per side until the cheese is melted and the tortilla is crisp. Slice into 3 triangles and serve immediately. For more easy holiday recipes using La Bottega di BelGioioso handcrafted cheese, register on Facebook to win two holiday cheeseboards – one for you and one for a friend! You’ll receive our free downloadable Cheese Holiday Guide just for entering. Be sure to visit our blog at savorlabottega.com/blog for elegantly simple tips and cheese recipes for any season.